The Little Town That Did! The Inspiration of it All! You Can Become a Member! 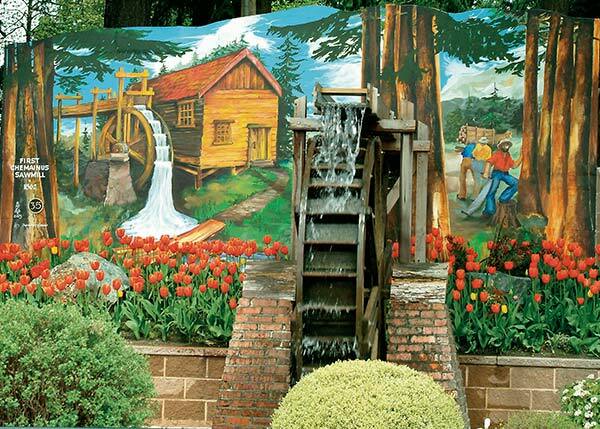 First Chemainus Sawmill 1862 was Verity Dewar’s third mural, one she thought of as a delightful challenge. While she was aware it is very unlikely that the old sawmill was ever as brightly painted as she depicted it, the positioning of the mural wall amongst the lovely dark trees and the shaded pathway within the park led her to be a bit whimsical in the treatment of her subject. Colour was the answer to what might have been a dark and receding work if painted in ‘normal’ colours. On a sunny day the rays of light on the mural change rapidly and add an interesting dimension to the work. The relatively simple painting style enables the flowers and shrubs planted below to stand out against the background and yet meld with the mural. 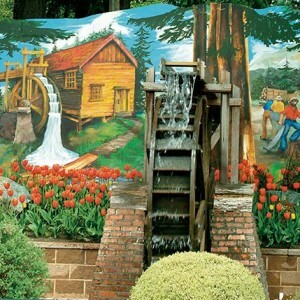 As the mill was, and as it is depicted in this mural, it remains a unique part of Chemainus history. This mural was painted as part of the 20th anniversary celebration.